← You Got Live Action in My Animation! 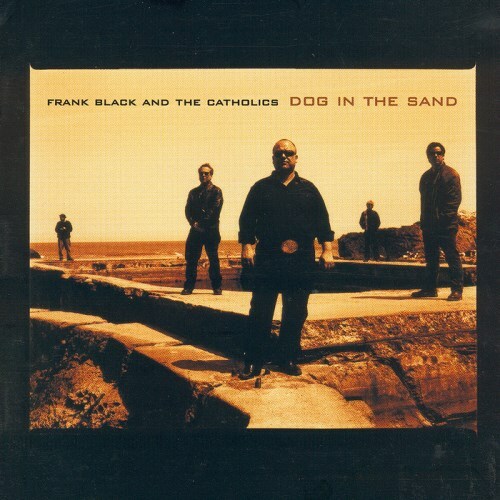 I’m not sure if anyone is reading these reviews, but since I enjoy revisiting the records, I’m going to continue with the 2001 release by Frank Black and the Catholics, Dog in the Sand. I purchased this album used when I was in graduate school, and I remember listening to it at the train station after class. It’s an excellent album, still recorded live to two-track like the other Catholics releases, but incorporating more instruments to give it a fuller sound. Eric Drew Feldman returns to play keyboards throughout. Blast Off – I’m usually kind of against starting an album with a particularly long song, because I feel it takes up too much of the listener’s attention. This is an exception, though, because it’s just a good opener. Aside from the title, I like the way it starts out slow, then becomes fast and energetic. It also brings back the space travel theme that had been largely missing on the first few Catholics albums. The lyrics in the fast part are mostly fragmentary, but there are some interesting references in there. The Union pour la Promotion de la Propulsion Photonique (called U3P for short) is a French group best known for their support of solar sails, Isidis Planitia is a plain inside an impact crater on Mars, and the bit about “take all my chemical for comatose” is probably about inducing sleep in space travelers. I’m not so sure about the references to Beckett, however. St. Francis Dam Disaster – Remember when I said that William Mulholland, subject of the song “Ole Mulholland,” would show up again in Frank’s music? Well, here he is, in the tale of the tragedy that basically ended his career. In 1928, only twelve hours after he and his assistant had conducted a safety inspection on the St. Francis Dam, it burst and flooded a lot of nearby towns. Much of the song is from the point of view of the water itself, presenting it as a slave seeking freedom in the ocean. The use of banjo and piano add a lot to the song. Stupid Me – After the grand themes of the first few songs, this song about regretting a breakup seems downright mundane. That doesn’t mean it’s bad, though; Frank has a knack for expressing the emotion of numbers like this. Bullet – This one is a favorite of mine, not just because it mentions the Norse concept of Valhalla, but because it’s really catchy, with a country-tinged rock sound. It’s apparently based on a real story, too; when I saw Frank at an in-store, he mentioned that, after his dad died, his brother called and mentioned his attic had been full of guns, each one with only one bullet in it. There’s a nice bit of meta-reference in this song, both with Frank complimenting drummer Scott Boutier at the beginning and describing the switch to a major key in the bridge. I’m not someone who usually notices key changes, so mentions of such often make me think of this song. The Swimmer – While I can’t help thinking of a troll on the Frank Black Forum who used the title as his screen name, it’s still a cool song, seemingly about someone who swims pretty much indefinitely. Frank says it’s based on a true story, but I don’t know any of the details. I say a little about the mention of ballyhoos and tritons in this post. I’ll Be Blue – A sad song that seems to be about feeling melancholy at a party, although there’s more to it than that. I appreciate the brief backing vocals toward the end of the last verse. “The Alleys of Old Lyon” is apparently a song by someone named Jason Norman, but I don’t know if he’s related to Larry. “Jesus Christ on the hill” probably refers to Calvary or Golgotha, where he was executed; but I’m not sure what was so sad about mastodons. Llano del Rio – This was the name of a commune in California founded by Job Harriman, whom you may remember from “Ole Mulholland.” It started in 1914 and was abandoned by 1918, becoming a ghost town that was later established as a California National Landmark. Aldous Huxley lived near there for a while in the 1940s, hence the mention of him in the song. Pearblossom is the name of a nearby town and a really dangerous highway, leading to “it can kill you just like possum.” The name literally means “plain of the river,” and I assume there’s no connection with modern musician Lana del Rey, although I guess you never know. If It Takes All Night – An optimistic-sounding traveling song. While established near the beginning as about living at truck stops, it sounds like the narrator isn’t actually a trucker himself. It switches locations throughout, first mentioning El Paso, then a couple of places in France. Little Siam is a Thai restaurant in Van Nuys, although I’m not totally sure that’s what the song is referring to. There’s a mention of the ghost of Johnny Horton, a country musician perhaps best known for “The Battle of New Orleans” and “North to Alaska,” for whom Frank has expressed fondness several times. He did an instrumental called “The Ballad of Johnny Horton,” and mentions his odd connection to Chet Baker in “Everything Is New.” I think this would make a good closer, but we actually get one more song. This entry was posted in Albums, Frank Black, Music and tagged aldous huxley, dog in the sand, eric drew feldman, hermaphroditos, isidis planitia, jason norman, jesus, job harriman, johnny horton, llano del rio, mars, robert zubrin, scott boutier, st. francis dam disaster, the case for mars, union pour la promotion de la propulsion photonique, valhalla, william mulholland. Bookmark the permalink.